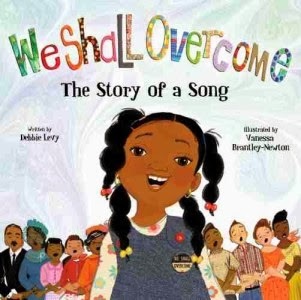 Summary: The book We Shall Overcome: The Story of a Song is about a song that represents the Civil Rights Movement and the fight for freedom, liberty and justice. This song represents individuals who fought their whole life for equality and freedom, this is their song, their story. Element 2: We Shall Overcome: The Story of a Song represents Element 2: Respect for Others because it showcases slavery, segregation and the Civil Rights Act. They show the fight for equality and why everyone should be treated the same, despite their skin color. Even though each person has a different skin color, they are still human beings. Everyone deserves the same respect, even though they may have a different skin color than their neighbor. This book talks about fighting for the right to be treated equally and even though they are not getting the respect they deserve, they know that one day they will too get that respect they seek. Activity: I would use this book by reading it to my class first, then completing an activity relating to skin color. After I read the book, I would bring out different colors of paint that the students could use to see what color their skin is. This will show each child that everyone is a different color and even though everyone is a different color, they should gain the same respect as everyone else in their classroom. I would also use this book to teach about racism and different obstacles that ethnicities faced. This would include slavery, the Holocaust, the Vietnam War, the Cold War, the Civil Rights Act and more. This book focuses mostly on Whites and Blacks and how there was It would show the children that everyone faces obstacles, not just the Whites and the Blacks. I want to be able to show my students the big picture.